The perfect solution for mounting flat panel displays, the sleek and stylish Chief PSS-2225B table stand provides a wide variety of features for most tabletop installations. Ideal for use in residential, commercial and business applications, the PSS-2225B allows for portrait or landscape flat panel installation. Features include 45° smooth swivel in either direction with optional stops, a 5" height adjustment, built-in cable management, and bolt-down capability for permanent installations and security. Incorporates Chief's ClickConnect mounting system for easy installation, stable mounting, quick release and optional security. Smooth +/- 45° swivel with optional stops at +/-15°, 25° or 35°. Provides 5" of tool-less telescoping height adjustment. Exclusive ClickConnect mounting system provides easy connect/disconnect without requring any tools. An audible click confirms panels are locked in place. Add a padlock to protect the display from theft. Has a horizontal adjustment from 7.87-39.33" and a vertical max of 20.37"
Holes are provided in the faceplate for use with an optional padlock or similar locking device. In addition, the pin and nut may be removed from the upper holes and moved to the lower holes for use as a more permanent locking device. Multiple cable management options for ease of installation. 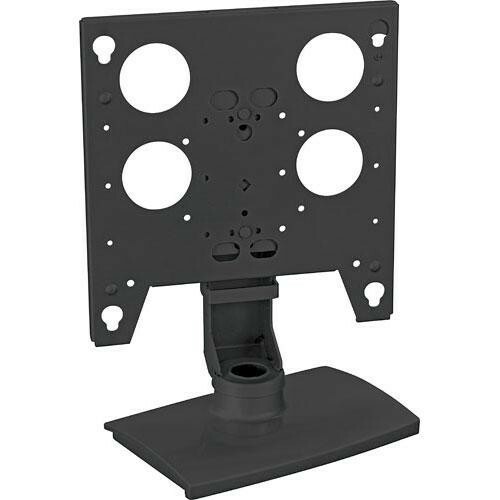 Simply route the cables away from the display and mount, or use the two internal routing pathways to conceal cables while allowing them to exit through the back of the stand or down grommet hole. Free standing with bolt down capability for permanent installations or security. Backed by a 10-year warranty to ensure that you are receiving the best quality product. Box Dimensions (LxWxH) 31.8 x 26.8 x 12.5"